PRIME LOCATION! BEAUTIFULLY UPGRADED! OCEAN & FAIRWAY VIEWS! NEAR POOL & SPA! GROUND FLOOR! FREE LONG DISTANCE CALLS & FREE High-Speed Internet and Wireless!! Luxury awaits you in this beautifully upgraded 3 bedroom villa. Magnificent ocean and fairway views from this 3 bedroom/corner unit with 1,698 square ft of living and lanai area plus a wrap around lanai! This is truly a beautifully remodeled and decorated unit. Once you enter this condo you will say 'Wow!' New Furnishings, Granite Counter Tops, Bamboo Floors, Travertine Tiles, Oak Cabinets, Decorative Lights, Top of the Line Stainless Steel Appliances, New air conditioners in ALL rooms, Newly Painted, New Beds, Flat Screen HDTV's in all rooms, even in the Kitchen AND A MUST SEE!! This is the largest floor plan in the complex and a corner unit with PRIVACY! PERFECT FOR COUPLES, FAMILY OR BOTH! Gaze at sunsets across the expanse of the 7th fairway, or sight an occasional deer scampering up the lawn in the early hours of the morn. Very Comfortable and Clean! Relax on your own private wrap around spacious lanai. Feel the wonderful trade winds sweep across the Greens and take in the aroma of the beautiful Plumeria trees and Hawaiian foliage. This extremely spacious three bedroom unit in the Wailea Grand Champions Villas comes fully stocked with all the amenities needed to make you feel as if you are in your own home. LOCATION! LOCATION! LOCATION! The Grand Champions have lush beautiful landscaping and amenities include 2 pools, Jacuzzi, BBQ and Security. This central Wailea location makes it favorable as you can walk to tennis, Shops at Wailea, casual to fine restaurants, World’s Top Beaches and Five Star Hotels. Whatever your vacation desires might be you will have a great time with your expectations delivered and memories of life time! There is a bath tub and shower in the guest bedroom. Shower in Master Bedroom. Free LONG DISTANCE CALLS, Free Road Runner Internet, Fully stocked Kitchen, Rice Cooker, Coffee maker, Toaster, Blender, Cooking Utensils, Hair-dryer, Linens & Towels, Books, 2 Hot Tubs and Pools & BBQ's on premises. No Smoking Please You are within walking distance of the famed Wailea Tennis Club, Fitness Center, Shops at Wailea, Restaurants and some of the world’s best beaches; Ulua, Wailea, and Keawakapu. Famous Wailea golf courses are within a 5-minute drive to the clubhouse! Nice, spacious 3 bedroom condo. Kitchen is up to date. Living room and dining room well-appointed and comfortable. 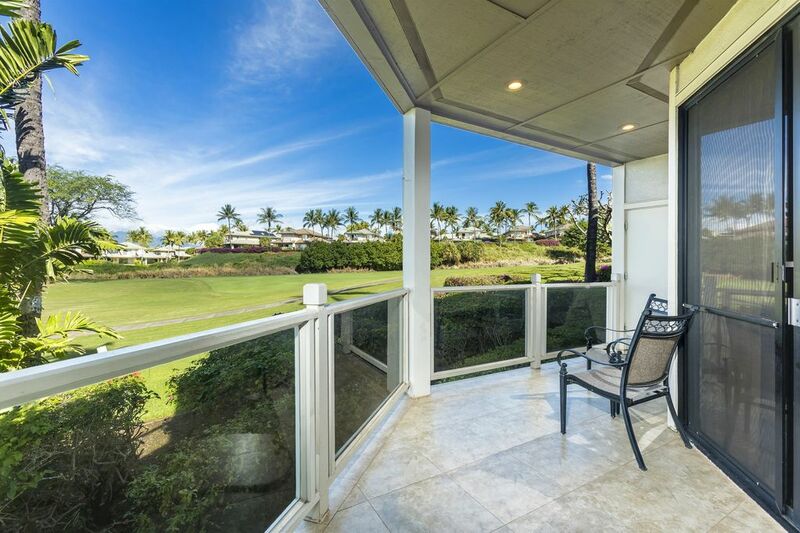 Large lanai with ocean and fairway view. A/c units in living room and all bedrooms. My only real criticism is the a/c unit in the master bedroom did not work well. We had to run it longer and at a lower setting than we should have to to keep the room comfortable. It likely needs to be charged or replaced. We arrived in the evening to a beautiful and clean condo at Grand Champions 169! We were ready and excited to begin our week long family vacation. The condo was very accommodating to our family of 7. Everything described was accurate and more! Everyone had there own space and were quite comfortable with their sleeping arrangements. There are plenty of blankets, pillows, and towels for us. The bathrooms are spacious with nice hot showers. The kitchen is fully equipped with all the essentials needed to make any meal you desire to have while staying. The grounds at Grand champions is quiet in the evening and waking to the sound of all the birds chirping is delightful. The sunset and peak of the ocean is breathtaking every evening on the lanai. It is very close to shops, restaurants, beaches, grocery, and of course golf! We enjoyed dinner and the best mai tais at Monkeypod just minutes away! Our favorite beach is Ulua, just right up the street. Great for snorkeling, soft sand, and amazing views! Thank you to the management for a wonderful stay at Grand Champions! We had a fabulous time here and can’t wait to return again soon. We truly enjoyed the comfort and cleanliness of the condo. We were beyond satisfied with the tranquil and clean condition of the condo. Great area! grounds kept up beautifully! condo very nice floor plan. Furniture although good quality wasn’t that comfortable and a little dated. Master bathroom was amazing! Very nice condo. Everything we needed. Pricey but nice.